Ever popular and one of the very first bisque head babies with realistic expressive features in the smallest ( 11”, 28 cm ) of the three known made sizes, known among collectors as the “ Kaiser Baby “, with head incised “ 28 K&*R 100 “, with all molded and painted hair and facial features and strung to the original five piece bent limb body with original finish with only slight paint wear and crazing typical of natural age wear. He wears a one piece pale rose colored suit which is both age and material appropriate………US$ 195. Very nice 15” ( 38 cm ) Kestner baby incised “ 211 “ with brown glass sleep eyes, open mouth with two lower porcelain teeth and wearing a very nice antique blond mohair wig which covers the remnants of the original skin wig which is quite worn but still glued firmly to the original plaster pate which has never been removed. The five piece composition bent limb body is in excellent condition with mostly original patina and red toe outlines but perhaps some old well done touch-up on the arms. Someone over the years has made him a one piece pink felt bonnet with pink silk edging which buttons under his chin and covers the neck and upper torso. A charming doll!……………US$ 250. 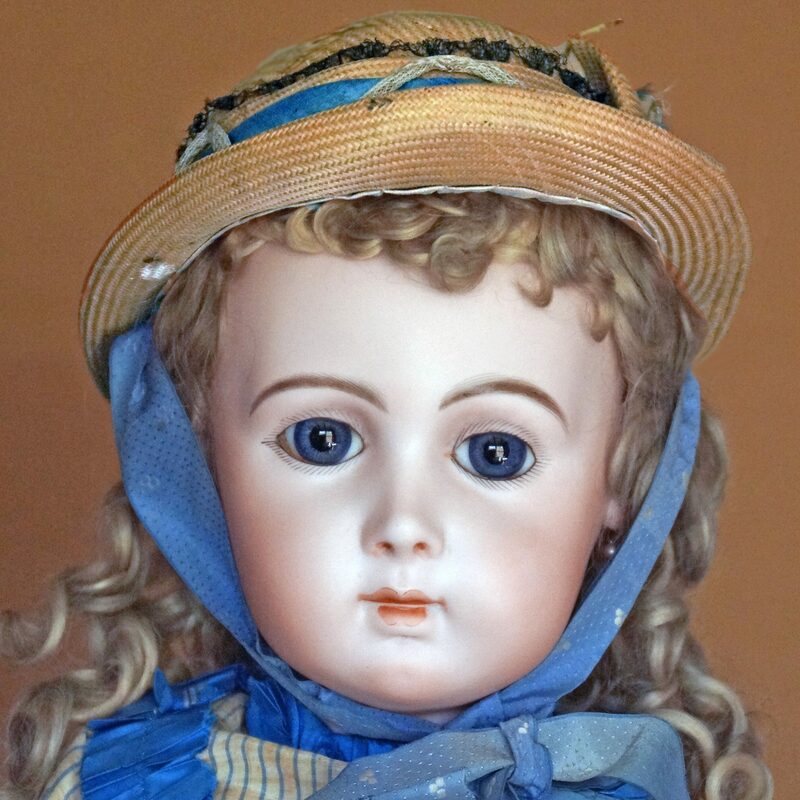 Attractive 14 ½” ( 36 cm ) baby with blue glass sleep eyes, open mouth with two lower teeth , wearing the original sheepskin wig covering the original plaster pate, and although the marking is mostly obscured by the wig is definitely a Kestner 211 model. The five piece composition baby body has original patina in overall good original condition with red toe and finger outlines still apparent with only a bit of typical wear and the inside of one finger with a minor chip. The one piece pink and white linen romper suit is of the period of the doll and could conceivably be original……SOLD.